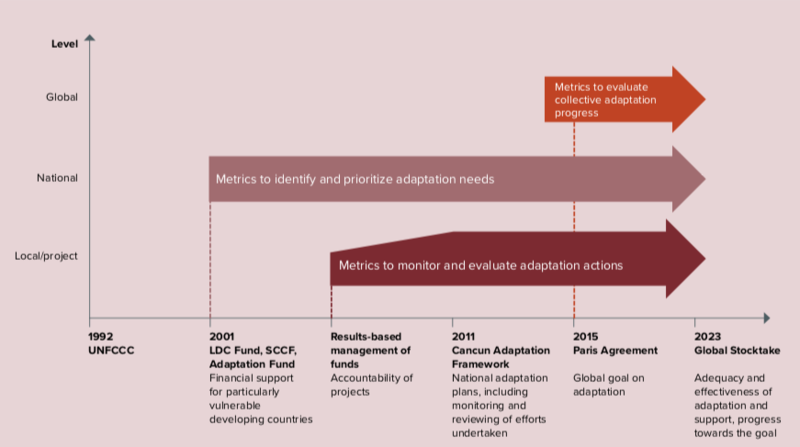 Evolution of functional needs of adaptation metrics over time in relation to the UNFCCC process (figure 1 of the report; page 17). From 'The evolution of adaptation metrics under the UNFCCC and its Paris Agreement' (Annett Möhner). The volume collects together eleven articles from international experts and practitioners, each offering their own unique insights and perspectives on this main thematic question. *Download the full volume from the right-hand column. Section A's contributions span more conceptual and methodological discussions related to this question. Provides an overview of the broad evolution of the concept of ‘adaptation metrics’ under the UNFCCC and in the Paris Agreement. It notes the general evolution of its objectives from prioritizing countries’ adaptation needs to ensuring the accountability and effectiveness of adaptation projects and more recently towards assessing global progress. Examines the distinct characteristics of climate change adaptation versus mitigation and the implications for measuring progress in these two interrelated policy domains. Through this discussion, the chapter also outlines some of the main pitfalls of applying adaptation metrics. As such it serves as good introduction to many of the general themes in the volume. Presents a comprehensive study of adaptation tracking needs among 191 stakeholders across the public and private sectors, showing how the objectives of adaptation metrics can be very different depending on who you are asking. The authors discuss why, in their view, universal metrics is an unavoidable concept when comparing the effectiveness of adaptation projects and prioritizing funding for them. They assess two possible candidates for generic effectiveness metrics: economic benefits, and disability-adjusted life years. Section B is sequenced based on a scale ranging from the local and/or project level to the national and sectoral or portfolio levels. Analyzes experiences in developing adaptation metrics for local government and community planning in several countries using the Tracking Adaptation Measuring Development (TAMD) framework, concluding broadly that local metrics need to be contextualized to reflect local realities. They further suggest that the best way forward for comparing and aggregating across such local contexts are through scorecard measurements. The authors discuss M&E frameworks and metrics applied in three donor-funded adaptation projects in Madagascar, analyzing how successful they were in measuring adaptation impacts. Experiences from the development of two national-level adaptation M&E frameworks are presented in both these articles (Germany; van Ruth and Schönthaler, and Kenya; Karani). The two articles together illustrate the similarities of the conceptual challenges involved, as well as large differences in national contexts in terms of data availability, institutional capacity and budgetary capacity. A common lesson, however, seems to be the importance of basing national adaptation M&E systems on existing data and processes, both to reduce costs and avoid duplication of data-collection processes, and also to improve the integration of adaptation into general national planning and development. Looks at experiences from the global Technology Needs Assessment project and the indicators proposed by countries for measuring the impact and outcomes of prioritized technologies. They then contrast these with the performance metrics expected by global adaptation investment funds such as the Green Climate Fund and propose ways to improve alignments between the two, thus increasing the chances of acquiring funding to implement countries’ Technology Action Plans. From the viewpoint of such an international adaptation funder, Leiter presents the approaches applied by GIZ, Germany’s development cooperation organization, and explains how it has mainstreamed adaptation into its existing M&E systems. Presents experiences from the health sector in developing outcome-specific indicators and advocates the development of indicators adequate for health adaptation. These would address both the factors that affect individual and social vulnerability to the hazards associated with a changing climate and the process of increasing resilience to the health risks of climate change. The global conversation around the measurement and tracking of adaptation is marked by a disconnect between the policy level and scholarly discussions, and practitioners in the field. In the absence of a global consensus on concepts and methodologies, practitioners in the field have developed de facto approaches and methodologies while implementing national and project-specific monitoring and evaluation systems. The scale of inquiry is one of the critical issues: metrics that are appropriate in measuring the results of adaptation at the local or project level may not be appropriate at the national or international (aggregate) level. Similarly, different metrics are often used in different sectors: agriculture-specific metrics, disaster-risk specific metrics, etc. Moreover, the specific local economic, environmental or social context could make it necessary to use different metrics even for activities at the same scale and in the same sector. This context-specificity of metrics illustrates that adaptation is itself a complex and highly embedded process that cannot easily be separated from the physical and social contexts in which it happens. The compilation of lessons obtained from ongoing or implemented projects provides great learning opportunities that could potentially inform both political and academic discussions. Some examples of such practical experiences are included in the articles contained in section B. This begs the question of what we can learn from such practical experience. ​Learning from stakeholders: The engagement of stakeholders in the co-creation of indicators has proved important in both sectoral projects and local adaptation tracking. Learning from national and sub-national experiences: Nationally, government-mandated national M&E frameworks can provide valuable insights for progress. Several countries are also linking national and subnational adaptation M&E systems. These national efforts add value through the compilation of scattered data into a partial national illustration of adaptation progress. Local-level experiences are also crucial, given the local dimension of adaptation implementation. Christiansen, L., Martinez, G. and Naswa, P. (eds. ), 2018. Adaptation metrics: perspectives on measuring, aggregating and comparing adaptation results. UNEP DTU Partnership, Copenhagen. This report combines case studies globally concerning the types and applications of local, indigneous and traditional knowledge for climate change adaptation. This guidance note illustrates how to mainstream CBA into the upper-scale levels by informing policies and programmes of community-driven adaptation priorities and innovations. Mozambique is one of the most vulnerable countries to climate change. This film shows some of the project PACA - Community Adaptation Plans of Action, in nine particularly vulnerable communities. Upcoming webinarCan we scale up early action through social protection? BRIGAID´s Climate Innovation Window aims to be a reference portal for innovations on climate change adaptation connecting several types of stakeholders. This article presents key findings from two recent studies that guide local governments towards flexible and robust coastal adaptation planning that addresses both social and physical impacts.